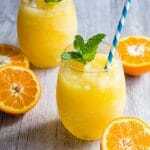 Frozen Orange Prosecco mixed with freshly squeezed orange juice and blended for a slushy like consistency. This is one easy drink that you have to make this summer! 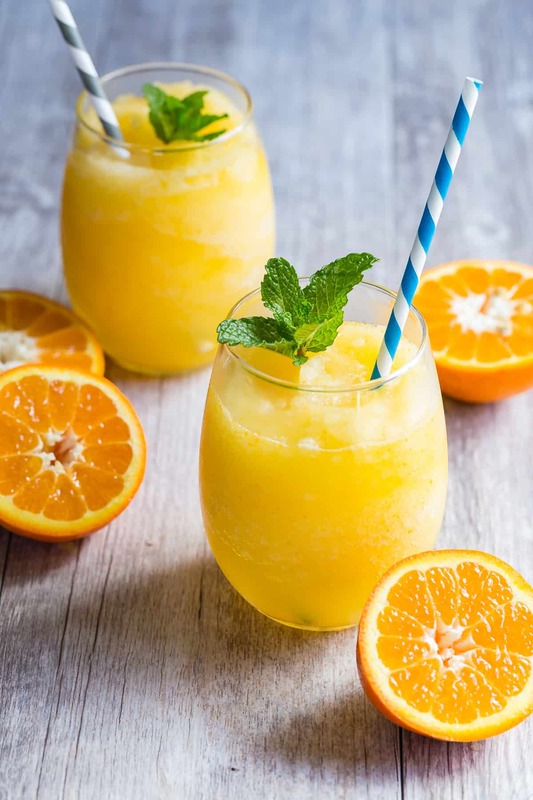 I think I have your answer to straight up easy summer relaxing, slushy style boozed up Prosecco with orange juice, and I’m calling it Frozecco!I think I just made up a word, but let me explain where the inspiration came from for this super oh-so-darn simple citrus drink. Whenever food bloggers travel, we Instagram every slice, crumb, burger and crazy cocktail we can get our hands on. And it just happens that my Instagram Stories was filled with delicious pics from friends attending Indulge Conference last week in Austin. One thing stood out to me as I clicked my way through the epic food pics on my phone though. I wish I could have been there supping on it with them. So what was it? Frozen Rosé wine blended with strawberry puree. Sounds crazy delicious right? But rather than just remake that Frosé, I racked my brain for something else to make and Frozecco was born. I switched the Rosé for sparkling Prosecco and planned to use peach puree, but it turns out peaches aren’t even in season yet. I should have known because my own tree just started blooming with a million bright pink flowers. While I’m on the tree subject, last week the family and I helped some friends harvest a bunch of citrus trees in their backyard. They came up with this awesome idea of donating all of the fruit to an organization instead of just letting the fruit fall to the ground and become waste. Fruit Forward even supply the tools and boxes so all you have to do is invite some people over and get the party started! Some of the oranges I picked were perfect for my Frozecco. Be aware that you need to freeze your Prosecco overnight but not in the bottle. No…that would be really bad! 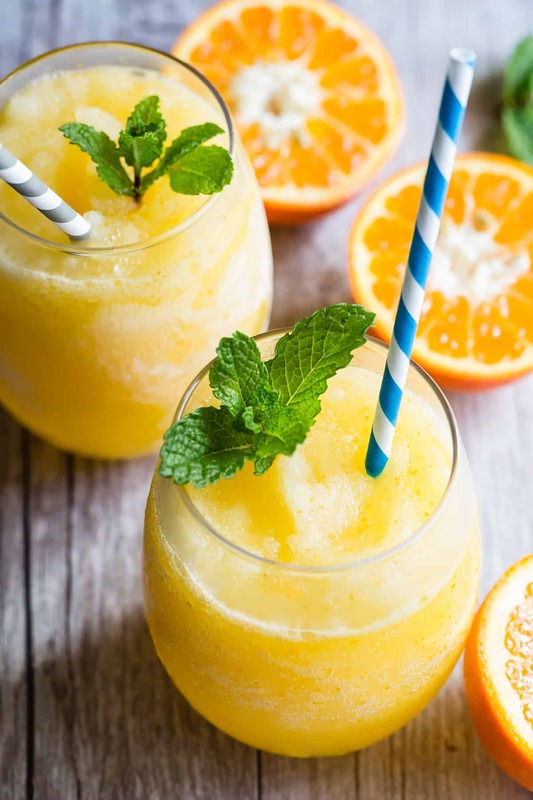 Frozen Prosecco mixed with freshly squeezed orange juice and blended for a slushy like consistency. This is one easy drink that you have to make this summer! Open the Prosecco and pour it into a 13 x 9 inch baking tray. Place in the freezer overnight. 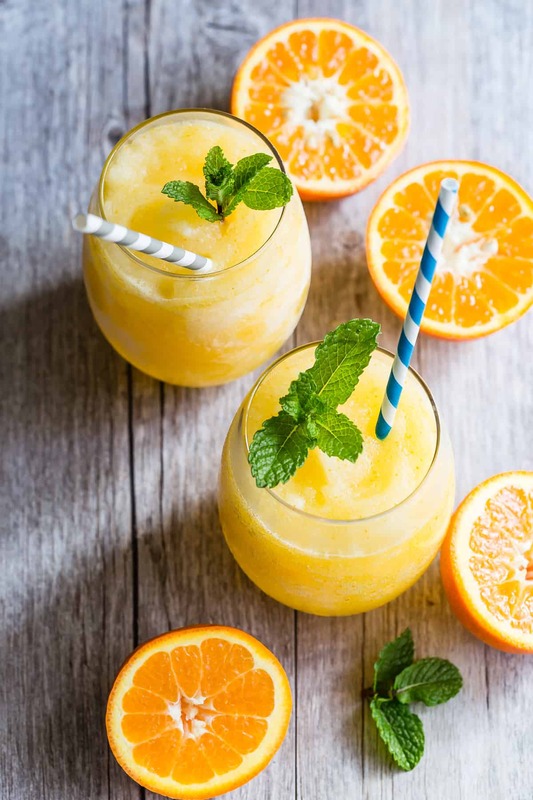 Once you are ready to make the Frozecco, place the frozen Prosecco into a blender in chunks and add the orange juice, ice cubes, sugar and orange zest. Blend on high until the mixture is smooth and looks just like a slushy. Divide the Frozecco between 4 small glasses or two regular sized jelly wine glasses. You may have to spoon the mixture into the glasses but it'll soften up as it melts. Garnish with a sprig of mint and add a straw. Serve at once. Oh my goodness, this is the BEST idea ever for using up lots of oranges from our backyard tree!! I always juice and freeze our lemons. Have you tried it the other way around–frozen orange juice and unfrozen prosecco? I cannot wait to be sitting by my pool drinking one (or ten) of these. Obsessed! I’m not going to wait until summer! I’ll be giving these a try for Easter brunch this weekend.